Meal prep is the sole reason my weekly dinners are a success. Think about it: It’s right around dinnertime, everyone’s hungry, but wait- the dinner you’re making is labor-intensive. You have to chop up the broccoli, brown some ground beef, and then you have to put all of it in the oven to let it bake for 30 minutes. That can be a lot of stress for one dinner! Especially with young kids running around. But what if a single session every Sunday could wipe away the stress of dinnertime for the entire week? I’ve been doing weekly meal prep sessions for about a year now and it’s changed my life. I don’t panic about what I have to prepare for dinner because I know almost everything is ready in the fridge. All the hard work has been done already. It sounds wonderful, right? But how do you start? 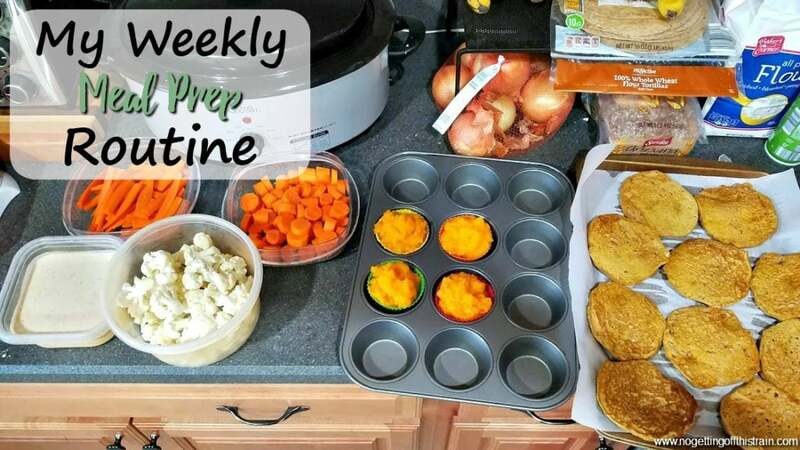 I want to show you my weekly meal prep routine. The actual food varies from week to week, but the principles are the same. Hopefully you can gain some insight and ideas on how to make your own week go smoothly! 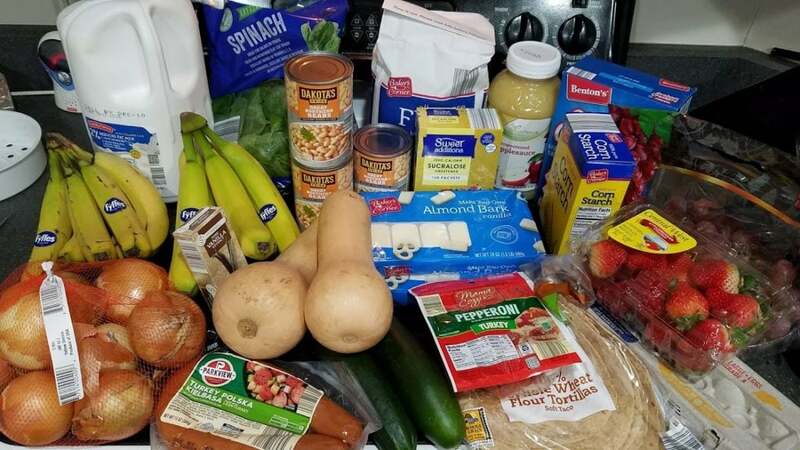 Here are the steps I take every week to make sure I have (mostly) stress-free meals. My meal planning usually takes place on Thursdays, which allows me time to go through my list and make sure I haven’t missed anything. Mistakes still happen, but I still try to double check. After I drop off Allison at school on Friday morning, I drive straight to Aldi which is just down the street. Then I head to Meijer if needed, which is easy because I pass right by it on the way home. I’ll then take pictures for Monday’s post and put everything away. Usually by this time I have a little time to clean the house or do some blog work; but I don’t do any prep this day because I don’t want to stop in the middle to have to pick up Allison. I’ve found that if I plan things out the day before, my day will go much smoother. I won’t be running around wondering what I’m supposed to do next- which happens quite a bit, to be honest. So I’ll either write my plan on paper, or put it in Trello, which is a task management app. My list is usually small and won’t involve a ton of work, but it depends on the week. Sometimes I’ll buy a ton of produce and have to chop it all; other weeks I just have to make a batch of pancakes and be done. After church on Sunday mornings, we’ll come home and have lunch. Then I’ll put on a movie for Allison and get to work. Yep, I definitely use TV as a babysitter, but I don’t feel bad whatsoever. If it means I get all my work done at once, I’ll do what it takes! What this usually means is that I have maybe 90 minutes max to get everything done. That’s usually plenty of time, depending on what I’m making; but sometimes it means I finish just in time but I leave dirty dishes everywhere. It’s all about balance. My reasoning is that I can put any baked items in the oven and work on pancakes or something on the stove while those bake. And inbetween whatever is cooking on the stove, I can chop vegetables. It’s multi-tasking at its finest, but it’s so efficient and helps me get things done faster. 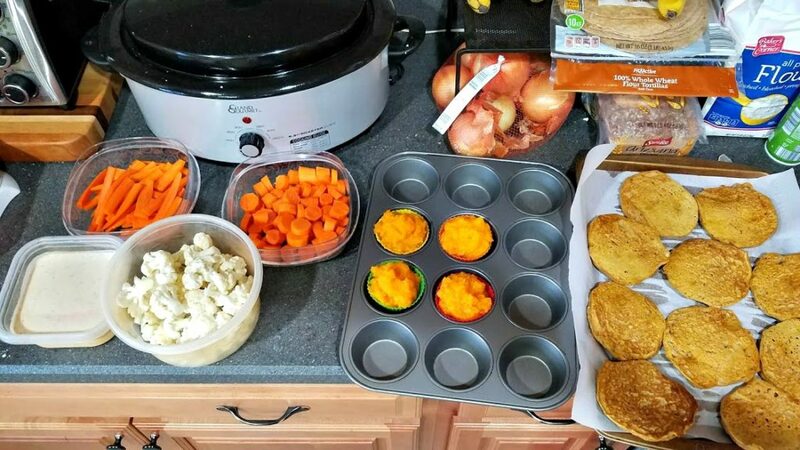 So here’s a recent example of a typical Sunday meal prep session. I started by cutting my squash in half and scooping out the seeds. I put it in the oven at 400 degrees and started the timer for 30 minutes. Then I made the pancake batter while the griddle heated up. When it was ready, I scooped on some pancake mix and got to work on the ranch dip. In between adding the ingredients to the food processor, I checked on the pancakes. They cook pretty quickly so I didn’t want them to burn. This recipe only made ten pancakes, so that moved pretty quickly. 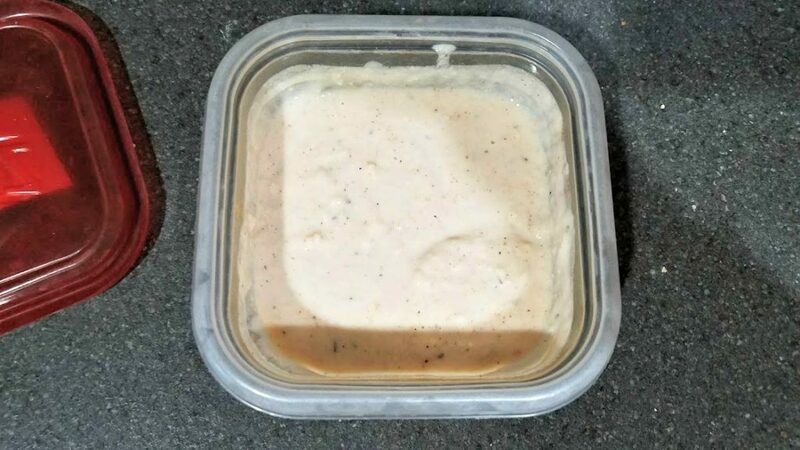 When the pancakes were done, I finished up making the dip and put it into a container. Then I had to wash out the food processor and get it ready for the butternut squash. 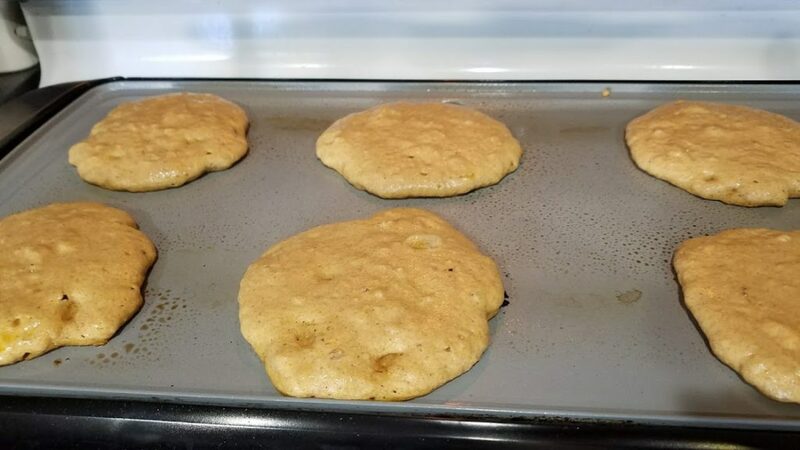 By that time, the pancake griddle had cooled off, so I moved it off the stove to make room for the squash when it came out of the oven. I scooped out the insides of the squash and blended it all until it was smooth, then used a half-cup scoop to put them in silicone baking cups. I froze some of them and planned to use the rest for other recipes that week. Then I got to work on the vegetables. 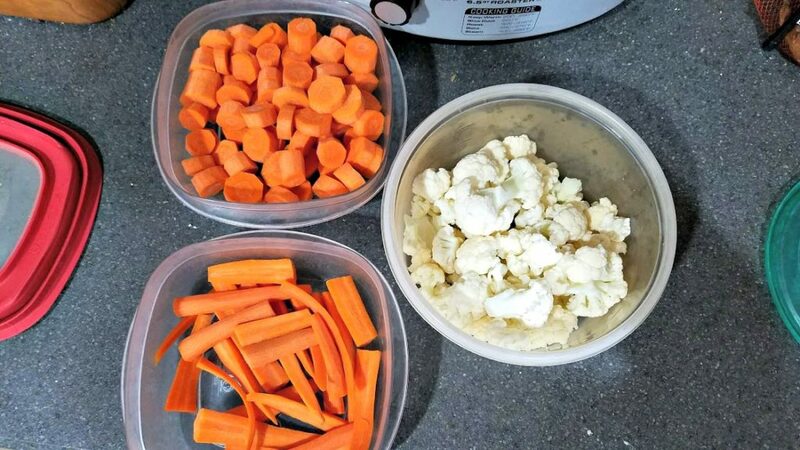 I chopped a whole head of cauliflower into small pieces, and then peeled and sliced a pound of carrots. They all went into containers for the fridge for snacks and as a side for dinner. This was the end result. It was a TON of work; in fact, it was one of my more labor-intensive meal prep sessions. I didn’t realize it would take so long- an hour and a half- but imagine the stress I saved later in the week by not having to do all this during dinner time. 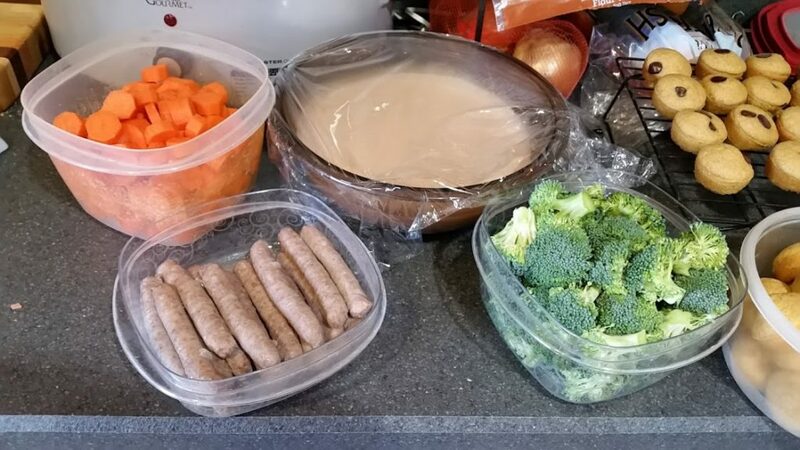 I hope this gives you a better idea of what a meal prep session looks like! 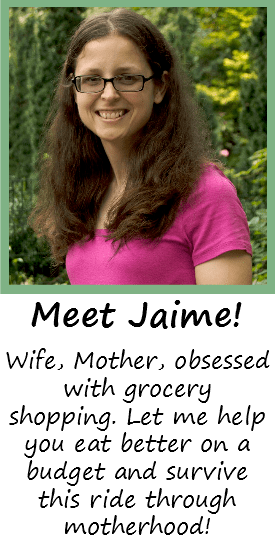 It really starts a few days beforehand, with the grocery list and a plan. You have to plan out and schedule these sessions, or they’ll never happen. 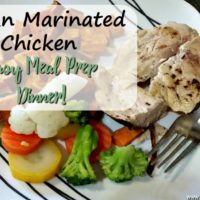 Do you have a meal prep routine? Leave a comment below and share with us to give us new ideas!